How have I only just discovered Vonlane?? Why drive yourself when you can nap on this luxury bus ride from Houston to Austin? I woke up, thinking I was still dreaming, to the news that the day after its release, The Weight of a Piano has already gone into its third printing. 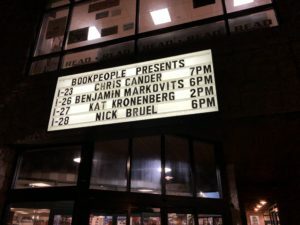 The lovely booksellers Meike and Annie met me when I arrived at BookPeople, where a wonderful crowd of old and new friends had gathered. I was also delighted and surprised that my parents were there and two high school friends I haven’t seen in years. My friend and Writers League of Texas director, Becka Oliver, was there to interview me, and I also had some great questions from the audience. 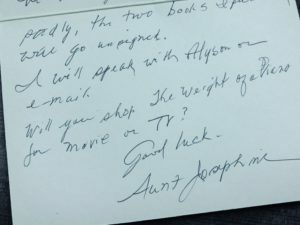 I had a lovely note from Aunt Josephine letting me know that she couldn’t be there, she’d picked up two copies of the book and couldn’t wait to start reading. I was pleased but slightly confused…I don’t actually have an Aunt Josephine. I picked up a copy of Small Fry based on Annie’s recommendation, and will read it on tomorrow’s drive to Dallas. Chris Cander is author of the novels 11 Stories, Whisper Hollow, and The Weight of A Piano. A Houstonian, she is a writer-in-residence for Writers In The Schools and serves on the Advisory Board of Inprint.